You must let blood to get blood. New Mexico, 1867. As consort to resurrected Mayan goddess Ixchel, hexslinger "Reverend" Asher Rook has founded "Hex City," the first place in all of human history where magicians can live and work together safely. But this tenuous peace is threatened by the approach of Rook's former lover, Chess Pargeter, bent on revenge over Rook's betrayal, as he kills his way toward the very same spot, dragging Pinkerton agent-turned-outlaw Ed Morrow along with him. Because Chess, sacrificed in Ixchel's name, has become far more than just a hex: his very presence has torn a crack in the world, remaking everything around him. And as the cycle of Chess's power approaches its climax, Chess, Morrow, and a young spiritualist named Yancey Colder--caught up in Chess's vendetta--will all have to shed yet more blood as they face down his mysterious patron demon, known only as the Enemy, along with every other enemy Chess has already made along the way. 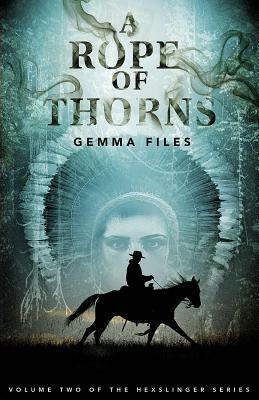 Gemma Files is the winner of the International Horror Guild Award and the Black Quill Award. She has been nominated for the Lambda, the Stoker and the Shirley Jackson Awards.